July 15, St. Swithun’s Day, is the One Day in the title of David Nicholls’ bestseller. This July 15, we’re making it the second selection of our Focus Book Club. Published as novel in 2009, then released as a film in 2011, One Day tells the story of Emma Morley (Anne Hathaway) and Dexter Mayhew (Jim Sturgess). We check in on the two on July 15 for nearly two decades, watching their individual lives rise, fall apart, stall, and finally come together in friendship and in love. Read the book, the perfect summer page-turner for a weekend or beach day. Rewatch the movie. Then tell us what you think on social with #FocusBookClub. We’ll share some of our favorite responses in our next Book Club piece. See the journey of Emma (Anne Hathaway) and Dexter (Jim Sturgess) in the One Day trailer. Nicholls discovered the organizing conceit for One Day from a passage in Thomas Hardy’s Tess of the D'Urbervilles where the heroine imagines how a life seen through a “sly and unseen” date might look. As a 40-year-old author, Nicholls looked for a way to sum up 20 years of life for his third novel. “That passage from Tess provided a clue, and the novel became 20 snapshots of a seemingly ordinary day,” explains Nicholls. To fill out the details of those years, Nicholls pulled memories from his own jagged trajectory, including a stint slicing up limes in a Tex-Mex restaurant like Emma does. In the end, Nicholls manages to paint a fully realized portrait of two people’s lives from the random details of one day. For The Guardian, Nicholls “has drawn on all his comic and literary gifts to produce a novel that is not only roaringly funny but also memorable, moving and, in its own unassuming, unpretentious way, rather profound.” It was also extremely popular. Not only was it Britain’s best selling novel of 2010, but it went on to be translated into 40 languages, ultimately selling over five million copies worldwide. 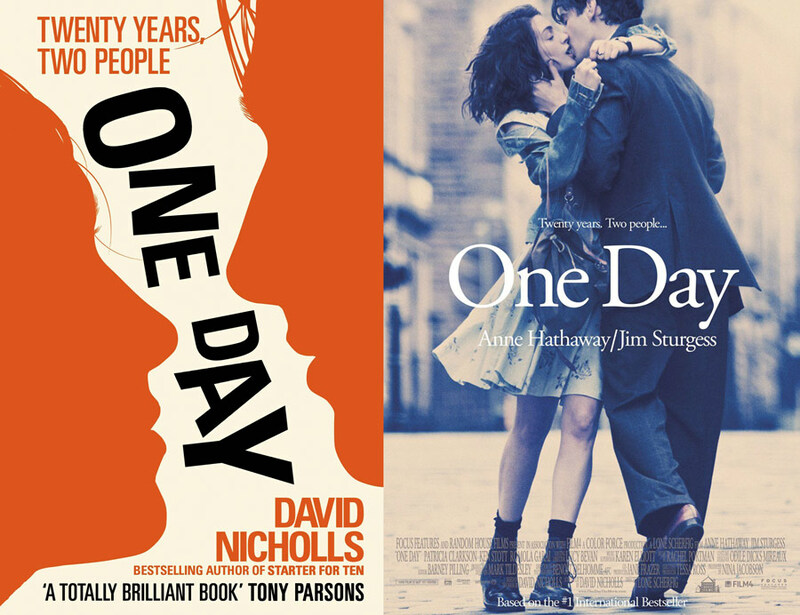 One Day's book cover and film poster. See the filmmakers and David Nicholls discuss adapting the novel to film. While writing the novel, Nicholls listened to different songs to jog his memory about the changing times in which the characters lived. To bring the novel to life, the filmmakers had to in effect create nearly twenty different period pieces, each changing ever so slowly in its fashion, music, and décor, but adding up to two decades by the end. “I want the audience to suddenly realize that 20 years have passed—just the way you do in life,” explains Scherfig. With a soundtrack that goes from Tears for Fears to Robbie Williams and Fat Boy Slim, and costumes that move from student grunge to tailored floral skirts (for her) and euro slick outfits (for him), the film gently guides you through the novel’s two decades.